The true story behind the recent Islamist attacks on Egypt's Copts—wherein over a dozen Christians were killed, hundreds wounded, and their churches torched—is as illuminating as it is sordid. To recap, Islamists—or "Salafists," as many in the Egyptian media are referring to the "Taliban-looking guys in slippers"—demonstrated before St. Mark Cathedral, insisting that their "Muslim sister" Camelia Shehata be released by the Coptic Church, which was supposedly holding and torturing her, a Copt, for converting to Islam. So Camelia once again appeared announcing unequivocally that she never converted to Islam, and would live and die as a Christian. Not ones to be deterred, Islamists immediately began rioting about how another Coptic girl, Abeer Talaat, had converted to Islam and was abducted and imprisoned by the Coptic Church—hence the violent rampage (which continued into the weekend, when Christians demonstrating against the attacks were attacked again, with one killed and over 100 injured). In fact, Abeer did convert to Islam. However, her family did not know; all they knew is that their married daughter had run off with another man. They brought her to stay at a guest house belonging to the church, designed to help separated couples reconcile. According to the priest, she left the guest house well before the Islamists began insisting that she was being held "against her will" in the church. 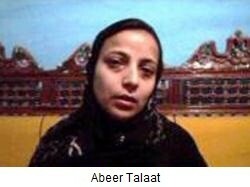 More telling is why Abeer converted to Islam: to get an instantaneous divorce from her husband. A Muslim cabdriver she knew told her that if she converted to Islam and "married" him (i.e., lived with him), that would automatically annul her marriage from the Christian. This of course is a Sharia stipulation, though one that (currently) contradicts Egyptian law, which views her as a bigamist for marrying another man while still being legally wed (she is currently in jail under investigation). Asked in a recent interview if she converted to Islam for its own appeal, or simply to get rid of her Coptic husband, Abeer said "No, I had a lot of problems with my husband and that's what caused me to do this [convert to Islam]. I asked 'How can I be rid of him [her husband]' and was told to 'be done of him by changing your religion' [to Islam], so I did this to be rid of him." Asked "Do you want to stay a Muslim, Abeer?" she responded with a small "Well, it's something that there's no return from." As we have seen, and as Abeer knows, Islam's views on conversion are dramatic: Muslims who convert out, the apostates, are to be put to death according to Sharia; non-Muslims who convert in—sincerely or not—are a source of great pride and parade. In short, all the death and destruction recently visited upon the Copts was performed in the name of a "convert" whose only motivation for converting to Islam was to gain an advantage against her Christian husband. Even the Islamist Muhammad al-Awwa, an inciter against Copts, recently confirmed that Abeer "has no connection with Islam" and does not know the first thing about it. Many Egyptian media commentators have rightly asked: what sort of Muslims are these who kill and destroy on behalf of an adulterous and bigamist woman—two great crimes in Islam? Apparently for some, gaining converts is more important than actually upholding Islamic principles; for others, any excuse to attack Christians and churches, even in the name of a nominal Muslim, is good enough. Finally, this entire affair is a reminder of the continuity of Islam's supremacist history. Despite the apologetics and white-washing, anyone who has studied the historic spread of Islam knows that most of the conquered, indigenous peoples who converted to Islam throughout the centuries did so, like Abeer, for the temporal benefits and advantages—including sloughing off dhimmi status—that come with joining the "winning team," and not for anything intrinsic. Perhaps this also explains why the Muslim world's "inferiority complex" is directly tied to the issue of conversion.